Based on fact, this gorgeous book shares the story of a dog that had an amazing life travelling the tracks in the early years of Australia’s railway network in the late 1800s. Rescued by a station guard from a carriage load of dogs heading to outback South Australia to be rabbit hunters, at first Bob waited at the station for his master to return each day. Eventually he joined Guard Ferry on his journeys and, finally, Bob travelled the tracks alone, befriending other guards, drivers and porters and always finding a warm bed at night wherever he travelled. Bob the Railway Dog is not merely a story of an adventurous pet, but also an account of the early years of the rail network in Australia. The story captures the sense of connection between the workers at the various stations and destinations, despite the vast distances between them, and the excitement of the changes brought about by the railway system. Corinne Fenton’s text evokes both an interest in the history of the railway network and an emotional response to the lovable character of Bob. Andrew McLean’s watercolour, charcoal and black pencil illustrations portray the rail network, vast Australian landscape and city scenes beautifully. Bob’s cheeky personality shines through in both text and illustrations and young train enthusiasts will enjoy the many images of tracks, engines, trains and stations throughout the story. 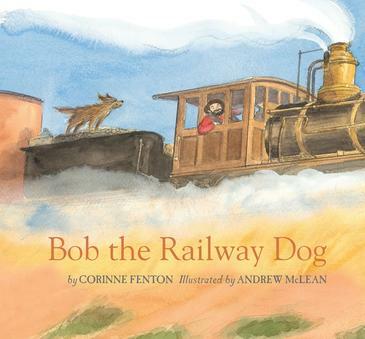 Bob the Railway Dog shares a heartwarming story from Australia’s history with young readers, adding an element of adventure and excitement to the development of the rail network through the outback. A framed photo of Bob is kept at Adelaide Station and at the National Railway Museum in Port Adelaide you can see the special collar give to Bob by the railway men who loved him best.